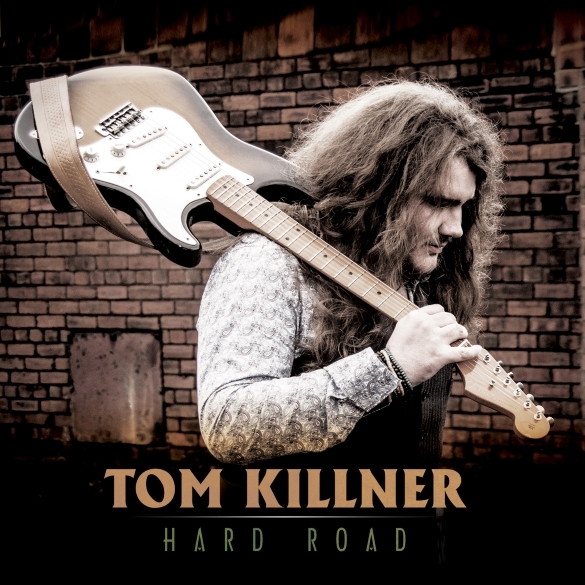 Los Angeles – One of the hottest young blues guitarists to emerge from the UK, Tom Killner, will be releasing his debut album “Hard Road” on September 4, 2015 on Cleopatra Blues in the US. Born in Rotherham UK, Killner was deemed a child prodigy of six-string blues by age 9, formed his first band a year later, and now at 19 his debut release contains a smoking hot collection of covers and originals! The album is currently at number 6 in the Amazon UK blues Hot releases charts! Says Tom, , “It’s been a long wait for my fans for me to release an album. Over the last two years they have asked when I would be bringing my album out, so when the offer came along from Cleopatra Records to make this album I felt greatly honored and pleased to be one of their artists, alongside the massive names on their label. “This album is my first and it’s really about the struggle, knockbacks and pain, and how you get back up and fight some more for what it takes to finally get there. That’s why I decided to go with ‘Hard Road’ as the title track. Along with the other tracks there’s love songs, soul and good old rock in there about my journey so far. There is something for everyone. When you get right down to it… to the heart of what the blues are all about… Eric Clapton hit the nail on the head. “It was one man and his guitar versus the world,” he said. “It was one guy who was completely alone and had no options, no alternatives other than just to sing and play to ease his pains.” It doesn’t matter how the music has changed and charged its way around the world in the years since the first bluesmen arose a century back in the American south. It doesn’t matter how volume and fusion and international superstardom have shaped and shifted things around. The blues that Clapton plays today mean the same thing that Howlin’ Wolf was playing in the fifties, and Son House was playing in the thirties, and they’re the same as Tom Killner is playing today. The sound may change, and the delivery, too. But the blues will always be the blues. Tom Killner understood that before he even discovered that the music had a name. The Tom Killner Band was formed in February 2012, a tight trio in the classic blues format of guitar (Tom), bass (Oliver Tallent) and drums (Jake Ashton). It was a line-up that worked for Cream, that worked for Taste, and worked for the Jimi Hendrix Experience. Now it’s working for the Tom Killner Band, as they set up the no-holds-barred barrage that hit that year’s Great British Blues Festival like a levee giving way, and has swamped every other stage the band has played on… from the vastness of blues festivals in Wakefield and Hebden Bridge (two years running, voted the UK’s best blues event), to theaters and clubs around the country. Endorsements from Fret-King and Vintage Guitar sent the band’s stock soaring even higher; while their first EP, “Complicated”, became a BBC radio favorite. And finally, inevitably, the Tom Killner Band’s acclaim reached across the ocean, to the Los Angeles headquarters of Cleopatra Records. Now, much to the excitement of blues music aficionados worldwide, the Tom Killner Band are releasing their debut album, knowing that it is already one of the most eagerly anticipated blues releases of the year. This entry was posted on Friday, September 4th, 2015 at 17:34	and posted in Press Release, Tom Killner. You can follow any responses to this entry through the RSS 2.0 feed.